This FSM3 is very clear and informative. I hope to have the chance to continue to FSM4 next year. Good work and presentation. Joey Yap looks better in person than in the picture plastered in his books and promotional banners. The founder and CEO of the Mastery Academy of Chinese Metaphysics recently launched his first introductory book on BaZi or Four Pillars of Destiny to provide readers with an easy understanding about what it is and how to use it to improve your life. The book titled BaZi – The Destiny Code Book is the latest title by Yap, who has also written various feng shui and Chinese astrology books such as The Thousand Year Calendar and Stories and Lessons on Feng Shui. “ Do you know that your birth data (year, month, day and time of birth) is an intricate code that contains information about your destiny – your talents, your hidden abilities, your character, strengths, weaknesses, challenges in life, achievements and your luck cycle?” asks Yap. “ Life’s challenges are never ending. But if you understand and know what lies ahead, see the obstacles and opportunities, strategise and plan your actions accordingly, life’s challenges are more manageable. 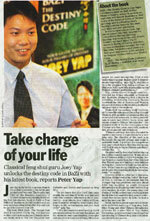 That is why understanding your destiny code is tremendously empowering,” says Yap,28, who claims he is the youngest feng shui practitioner in Malaysia. He is especially popular among the English educated professionals. Yap, whose father is an accountant, received his formal education in Malaysia and Australia, graduating with a degree in commerce from Curtin University. He has combined the best of Eastern and Western education systems in the teaching methodology practiced at his academy. Students of the academy study traditional Chinese Metaphysics syllabus but through western-style modular programmes that are structured and systematic, enabling individuals to easily and quickly learn, grasp and master complex Chinese Metaphysics – the classical study of the five techniques or five Chinese arts that cover mountain, medical, fate, physiognomy and divination. “ Chinese astrology has been shrouded in mystery and mired in superstition for a very long time. The objective if this book is to demystify the age-old science and make it accessible to all. It is set out in a comprehensive, easy to-read style so that even the layman will find it easy to learn Chinese astrology,” reveals Yap. His penchant for feng shui started during his student years in Australia. “It was all due to self-interest initially. I didn’t take any formal feng shui classes then, but when I realised that Westerners were taking a keen interest in feng shui, I decided to make money on the side. While I was doing consulting services, my friends were washing plates in the restaurants,” he recalls. However, when he returned to Malaysia, his father disapproved of his ‘hobby’. He wanted him to become an accountant, but the younger Yap was persistent and went ahead with his decision to study Chinese Metaphysics in Hong Kong under several feng shui masters. In short, the young man took charge of his life as there was a burning desire inside him that wanted to help people understand themselves better in order to lead a more harmonious life. Today, Yap has global organisation devoted to worldwide teaching of feng shui, BaZi, Mian Xiang and other Chinese Metaphysics subjects. He is also CEO of Yap Global Consulting, an international consulting firm specialising in Chinese feng shui and astrology services and audits. BaZi – The Destiny Code is Joey Yap’s introductory book on BaZi or Four Pillars of Destiny, written in an easy-to-read style with helpful illustrations. BaZi is one of the foremost forms of Chinese astrology and utilized by Asia’s leading business tycoons, film stars, pop stars and even politicians. In this comprehensive book, Yap delves deeper into BaZi, beyond the conventional Chinese astrology readings that focus on the year of birth. Readers can learn about the 10 Heavenly Stems, 12 Earthly Branches, special relationships between the Five Elements, the technique of plotting a BaZi chart and simple, quick analysis techniques for deciphering your Destiny Code.